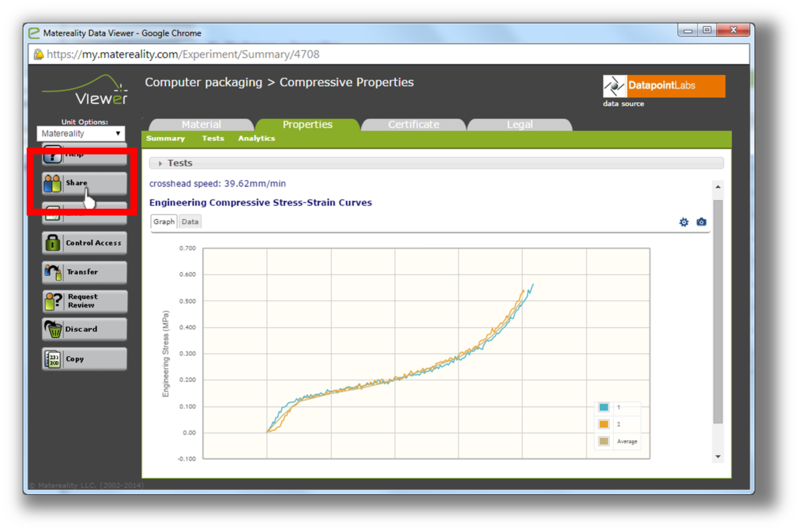 Our detailed and comprehensive collaborative framework allows you to send material property data, CAE models, and even test reports directly to your colleagues and partners, without having to rely on other collaborative software or email clients. This means you can skip the PDFs and email attachments! Send your data to anybody whether or not they are already Matereality users. Recipients can be employees of your company, based locally or at another location, or even employees of another company. Share your data by selecting the data, and clicking the Share button. Fill out the form to compose an email inviting recipients to view your data. Click Submit to send the email to your recipients. Figure 2. 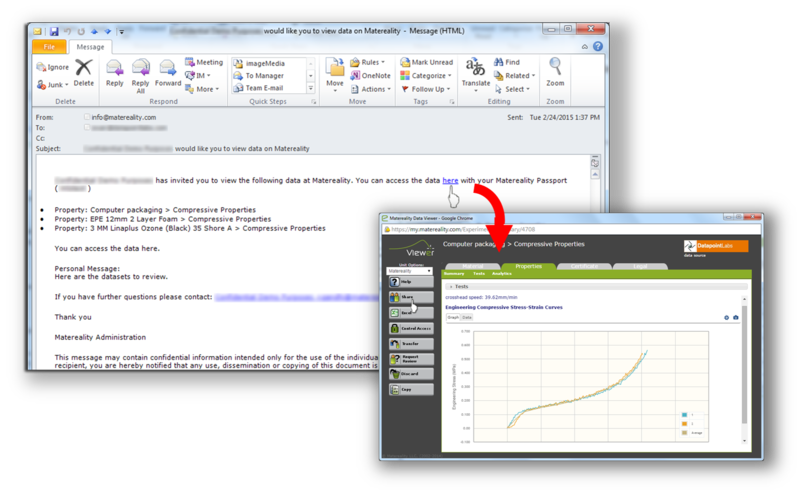 In the Viewer module, use the Share tool to share a properties dataset. You can share any data that appears in your database, published or unpublished, whether or not you are the data owner. If any recipients are not Matereality users, they will receive a prompt to create a Matereality login at no charge, so they can view the data you shared. Note that if you share data you do not own, the recipient’s access will depend on the access controls that have been set by the data owner. Recipients receive specific URL links that enable them to view the items you selected. Once recipients access Matereality, they see the selected data exactly as you see it, and they have the ability to explore details associated with the shared data on the same platform. The links are enabled only for the recipients you designate and will not work when forwarded. In addition, you can revoke access when your collaboration is done. Figure 3. Email links send recipients directly to the data you shared. Managing the data you've shared is an important part of Matereality's collaborative framework. Matereality provides apps specifically to monitor the use of data you have shared. Use the new Collaborate app to view all data you have shared with others, as well as data that others have shared with you. Use the Activity Tracker app to monitor who has accessed the data you shared, and on what date. Upgrade your Matereality Personal Material Database to a Workgroup Material DatabasePro to collaborate internally and work with data owned by anyone in your workgroup without having to share it. 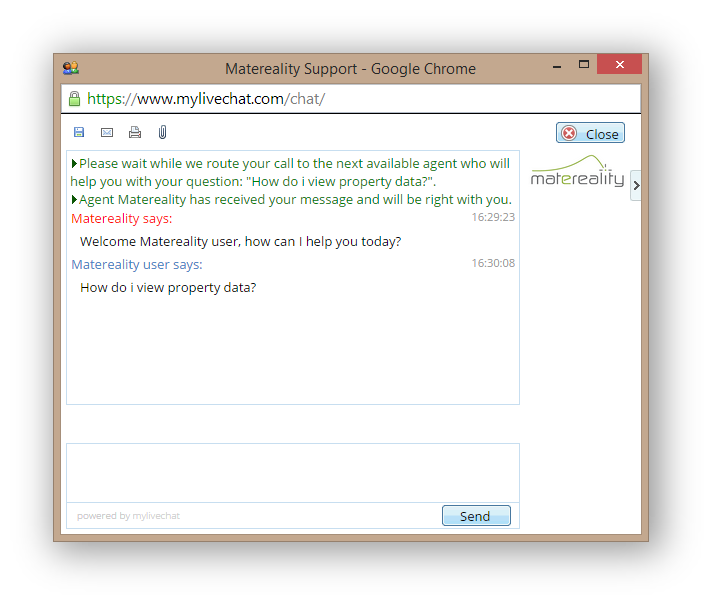 When logged into Matereality, click the Live Support button located at the bottom right corner of the window to speak with a Matereality representative. The new Support feature lets you speak with someone on the Matereality support staff in real time. They can walk you through any Matereality feature over chat, or they can connect with you via WebEx to speak with you directly or share their screen with you. During off-hours or when there are no agents available, you can send a message to the Matereality support staff by clicking the Request Help button. 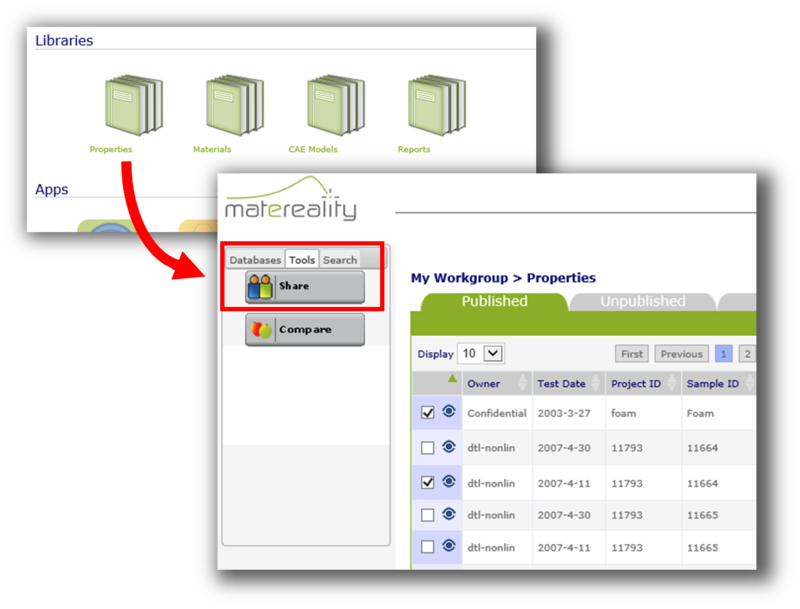 The Matereality Workgroup Material DatabasePro solution enabled through the Altair Partner Alliance allows Altair HyperWorks users access to browser-based software to build and maintain productivity enhancing material databases on the same platform that they use for product design. The updated installer streamlines the download process, and gives Altair users running version 13 of the Altair License Server access to Matereality as part of the Altair Workgroup.